I had a about two hours to kill last night so I decided to do so solo roaming in Star Citizen Alpha PTU 2.5. Above is the raw footage. A fairly docile night of earning some aUEC so I can buy some toys. After some technical difficulties (doggie bathroom break and of course alpha instability) I spawned into Crusader. Spawned a Hornet F7C with Tarantulas mounted to a ball turret off of a Super Hornet and to the nose – the wingtips had Badgers and I had swapped out to Marksman I missiles. I started out by running Comm Array repair missions to earn some easy aUEC to fund future escapades. My first jump was to Comm Array 126. Upon arrival, two NPC Pirates flying a 325 and a Gladius jumped in. Both jumped in with a very low radial velocity to me, which makes them easy pickings for my Tarantulas. The 325 was closer and flying directly at me and it went down first. While engaging the 325 the Gladius managed to lock and fire a missile off at me, which I flared and evaded. The Gladius banked hard to its left and in doing so gave me a full exposure of its belly, which I ripped to shreds with my Tarantulas in a few volleys. Engagement over. Someone had already been on EVA to repair this comm array so I jumped to Comm Array 472. Upon arrival two pirates jumped in: A 325 and I believe a Cutlass that ran off (current known bug with 2.5). The 325 jumped in with some radial velocity and a chase ensued. After a few salvos, the 325 went down. All clear and I approach the array to begin the EVA repair of the equipment. Repair and return to my Hornet go without a hitch. Off to the next: Comm Array 730. Upon arrival I see a single pirate engaging two other green fighters. Due to a targetting system glitch, no ID was returned on the type of ship the pirate was flying. With 3 ships engaging the pirate, he went down quickly. I caught a quick blip of a pirate Cutlass which disappeared from radar quickly. I jumped off to let the two other green fighters have the array. Off to Comm Array 556. Two pirates jumped in. One in a Hornet F7C and one in a Cutlass. The Hornet F7C pushed to my left and I gave chase, downing him quickly with all five of my guns. The Cutlass was running so I gave chase. Upon giving chase he turned and did a suicidal run at me. EVA repair went without a hitch although a friendly ship did jump in while I was out of my ship performing the EVA. Off to Comm Array 625. Two more pirates. The first run straight at me and was destroyed in a few volleys due to a zero’d radial velocity. The second in a Cutlass attempted to run but I managed to close the distance and chew it to shreds. I attempted to land on the side of the array’s superstructure but apparently the hatch didn’t want to open so I had to lift off of the array a meter or so to exit the cockpit. Another EVA repair that went off without a problem. I performed an EVA inspection of my ship which appeared to only have minor damage that didn’t affect performance of the damaged components. Next stop: Comm Array 306. You guessed it, two more pirates. But there was also another green ship there. And then the game crashed. Victory. If you aren’t pushing the envelope, you aren’t trying. Reload and respawn another Hornet and jump to Comm Array 126 to fix the array. A pirate Hornet makes a run at me initially and after taking a salvo from my guns attempts to turn off my approach vector and is destroyed. Two more pirates flying 325’s are eaten up quickly by my guns followed by a second pirate flying a Hornet. EVA repair goes without a hitch, although I was greeted by another player on EVA as I was exiting the array. Arriving at Comm Array 306 and I’m greeted by two pirates moving vertically across my vector. I give chase to the Cutlass and send a Marksman I missile in its direction. The missile is evaded by use of a flare from the Cutlass. Seeing this, I line up my guns and make short work of the Cutlass. The next pirate, a Hornet, is flying towards me by the time I get him lined up. I start engaging and he attempts to break to his right, my left, but is destroyed by my superior gunfire. EVA repair goes as planned, but upon exiting a ship is destroyed in close proximity to the exit. At first I think it is my Hornet, but I quickly realize it is a 325a and that my Hornet is in good shape. At this point, all of the arrays are good to go so I sign up for some job helping out the ICC with some exploratory work. Jumping to the ICC Probe, I am given my mission and my jump coordinates for my next tasking which sends me to an asteroid pocket. I see a red beacon upon arrival. I begin to approach it. About halfway between the beacon and my arrival point, two pirates jump in in front of me. Two M50 interceptors. We close the distance and begin maneuvering on each other. The first takes a bit of maneuvering to get behind and line up my guns. Once lined up, it didn’t last long. The second maneuvers on me quite well and puts some distance between he and I. However, it makes a fatal mistake and takes a run at me and is destroyed when we are within close proximity of each other. Unfortunately I allowed myself to get too close and I lose my port side wing when his debris runs into my ship. I lose my left Badger repeater with the wing. All other systems still appear functional so I continue on with my mission towards the beacon. Upon closing with the beacon, a seemingly unoccupied Freelancer appears on my radar. It isn’t moving and I see no activity. Not worth my time, I ignore the Freelancer and approach the beacon to retrieve the black box data. Mission complete. 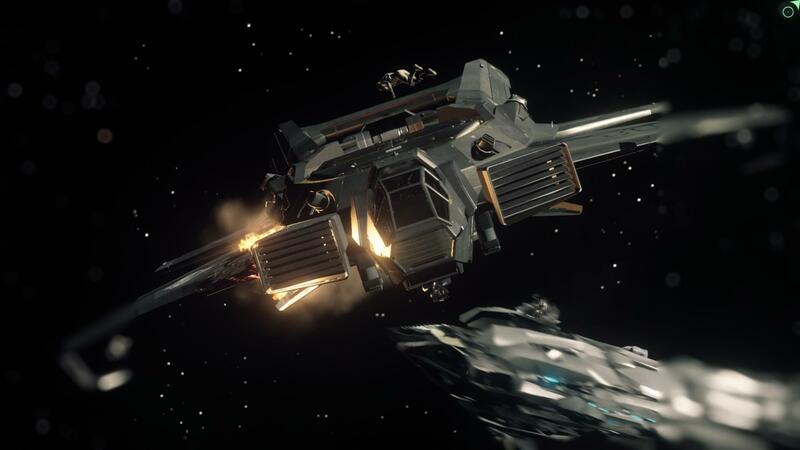 With a damaged ship, I opt to ignore the Freelancer and return to Crusader where I planned to land my Hornet and swap out to my Gladius. I swap out to a Gladius with 4x Rattler II’s loaded on instead of the standard size 2 missile and head off to Comm Array 306. I am greeted by a pirate-flown Aurora which takes me 3 or 4 passes to take down. An M50 interceptor flown by a pirate gets caught up in the solar arrays of the comm array so I come to a stop to engage the pirate as he tries to get out of the solar arrays. (Mistake #1.) While I’m slowing down, another ship jumps in but I allowed my tunnel vision on that pirate ship to get the best of me (mistake #2). I am subsequently destroyed by an unknown ship, possibly another player. Respawning at Port Olisar, I go with an Origin Jumpworks 350r for the next leg of the night’s adventure. After fumbling with getting into the pilot’s seat and underway, I head off to Comm Array 306 again. My thoughts were that another player may be potentially camping the array. Upon arrival I see a green ship and three pirate ships. I push to engage an M50 interceptor. After giving chase and a pass or two, I ram the target and destroy it. It is then that I determine that the main guns on the 350r are not gimballed and I start fairing much better against future targets. Despite my fumbling with getting into the 350r, I manage to get out of the ship quite easily to begin my EVA into the array for repair. The repair proceeds without a snag and I am back inside the 350r in no time heading towards Comm Array 556. Waiting for me at 556 are two pirates. An M50 which I manage to crash into on the first pass which sends my ship spinning but otherwise okay. On the second pass, I wasn’t so lucky and both ships are destroyed in a solid collision between the two. I hop into an Origin Jumpworks M50 interceptor and head off towards another Comm Array repair mission… This time it’s Comm Array 275. I jump into a target rich environmnt. Upon arrival I see three pirates on the radar and I begin engaging an Aurora immediately. I easily outmaneuver the Aurora and the two other ships that have begun to give chase. More pirates jump in. I am quickly being targetted by at least seven pirates, some of which are firing missiles at me. After outmaneuvering enemy ships, gun fire and missiles for several minutes, I decide that the low damage output of the M50 isn’t breaking even and I jump out… to Yela to find the pirate base, Grim Hex, which is a tale for another night.